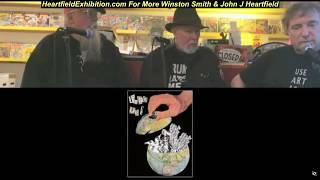 Winston Smith John Heartfield London Event: Winston Smith & John J Heartfield, grandson of Dada & Political Art Genius John Heartfield, are interviewed by Savage Pencil in London, May 2018. TIME: 3:53 – 13:30 John briefly talks about the important formative events in his grandfather’s cinematic life story. Left to Right: Savage Pencil, Winston Smith, and John J Heartfield at the Orbital Comics Event, London, May 19, 2018.